The implication of which is that the Government admits that prohibition creates acquisitive crime. 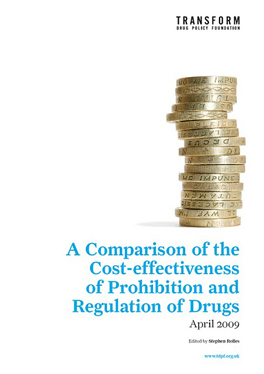 Home Office estimates suggest that crime costs associated with prohibited drugs are about £15 billion a year. These deliberations on cost benefit analysis have never been made public and, suggest that “arguments” have taken precedence over evidence. Transform's submission concludes that political parties will not engage in genuine debate and that it is up to individuals from every walk of life to challenge drug policy spin and debate the issue in their workplaces, professional bodies and social circles to avoid another ten years of self inflicted disaster. “The consultation should have been a thoroughgoing review of the policy making process and the impact that policy has in the everyday world. In the event, it turned out to be a sham. The consultation document is another dodgy dossier. It contained no proposals, breaking one of the fundamental rules for consultations. The document was the most blatant propaganda we have yet seen to support ten more years of prohibition. During the process Gordon Brown announced that cannabis law would be changed and that drugs will never be decriminalised. Lastly, the Government targets were announced, predetermining that the entire framework for future policy development would be unchanged. 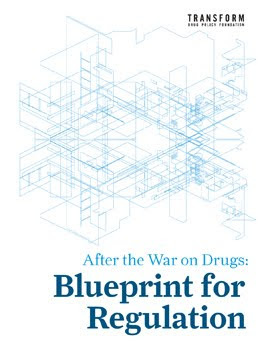 “We have an enormous amount of evidence now to show that the Government is in full possession of the facts that the policy of prohibition of currently illegal drugs is the significant driver for harms associated with their production, supply and use. Prohibition is a policy of mass destruction, from Afghanistan and Colombia to London and Liverpool. Transform's submission contains extracts from previously unreleased correspondence from the Foreign Office and the Home Office demonstrating that both departments admit that prohibition causes great harms but that neither are willing to contemplate change. This intransigence is despicable, given the level of chaos and misery associated with the illegal drug market. The correspondence quoted above demonstrates that Government drug policy is explicitly based upon claims to have won an “argument”, rather than evidence. Whilst Government uses primary school debating society rhetoric to decide its drug policy, huge swathes of the global population die or live in misery and degradation as a result. All very depressing yet so very predictable. TDPF have won all the arguments time after time by beavering away and replying to Government consultations. As I said before this ain't enough. That's 4.5 million "criminals" regularly breaking the Misuse of Drugs Act 1971, which still contains prison penalties for simple possession. Be under no doubt that the courts would use those penalties if they could. But they can't due to sheer weight of numbers. With 4.5 million potential recruits for funding Transform, one would think they would be one of the richest charities around. However the "Trustees" don't think it is a good idea to pro-actively market to, and fundraise from, those 4.5 million potential donors; at least 5% of which are likely to be millionaires. Apparently they think Transform should maintain a low profile and struggle on with a diet of peanuts and goodwill. Meanwhile it's business as usual for the prohibitionists with no sign of any real change. Maybe the "Trustees" should read a book on marketing or brand development or generally any business book on how to grow a corporation with a potential customer base of 4.5 million. Or maybe Transform need some new Trustees who actually live in the real world and want to see the aims of Transform actually become a reality one day. FUNDRAISE, roll out mass market ad campaigns, full page ads in national press on a weekly basis, lobbying for change, lobbying the public and the elites for money to do more lobbying, become a multi-million pound operation.